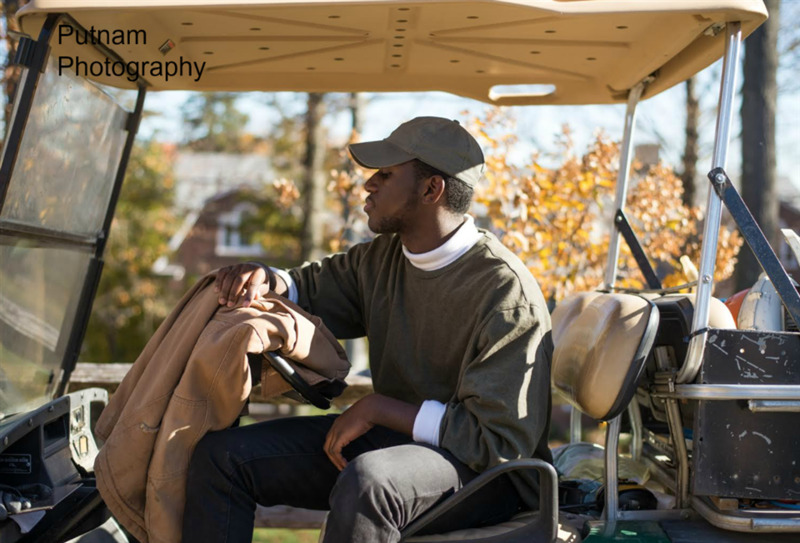 Mike Lazarre ’18 poses on a golf cart. Am I Too Black, or Not Black Enough? Since I was born, I was reminded that I am not black, but Haitian. My parents urged me to remember this distinction — an attempt to remove myself from whatever stereotypes came along with the color of my skin. As I grew older, I grew to question this notion, wondering why blackness was immediately synonymous with an image my parents did not want for me. Why is blackness associated with unintelligence? Why is blackness associated with poverty? Why is blackness associated with inferiority? In a school where my skin immediately serves as a visual factor setting me apart from the majority of my peers, I have come to find ways to analyze this difference. Prior to attending Hopkins, I attended a predominantly black middle school — having classmates that played their music too loud, who knew all of the lyrics to the latest hip-hop songs, who laughed if you couldn’t dance. I remember seeing the beauty in it all. I also remember the social paradox that we were reminded of in the eyes of white teachers, in the media, and in the private high schools that most of us would soon attend. It was the paradox that taught us that our world was different than theirs. “Theirs” being the white world. The real world. A world that I would always have to face, even if it would not care to turn and face me. When transitioning into a predominantly white institution, I was one of three black men in my graduating class. I felt the need to reduce myself, an attempt to make myself less visible. I wanted to avoid becoming too loud, too black. I wanted to be smarter than my white peers, not because I actually wanted to be the best, but because the slightest form of unintelligence could prove that I was adhering to the black stereotype. I wanted to speak proper English — the “white” way — because any sign of slang would prove that I was ignorant. I wanted to be careful and polite, because any sign of attitude would imply aggression. At the same time, I wanted to adhere to the image that I was meant to be for the white audience — a comedian, an athlete, a “cool kid." However, over the past four years at Hopkins, I realize that the standards I had given myself were only results of the insecurities that accompanied the black individual for centuries — the insecurity that the black identity requires justification for acceptance. The notion that my assimilation into any space requires a change in my natural self. During my junior year at Hopkins, I got involved with the Hopkins Student Diversity Board, which was able to provide me with the platform to come to terms with my identity in conjunction with my environment. While on the board, I grew to understand that I was not alone in my struggle to adhere to the overall “norm” of Hopkins. I learned that diversity is about so much more than just race. Diversity represents all of the facets of one’s identity that makes him unique. However, I also discovered that for an institution to claim to be diverse is not enough. Racism cannot be solved just by integration (as we’ve witnessed over the past few decades). Homophobia cannot be solved just by legalizing gay marriage. Sexism cannot be solved just by giving women visible platforms of authority. It is by allowing room for open conversation and discussion, and not debate, that we can progress as a community. It is through recognizing that exchanging ideas and beliefs is not for conversion, but for knowledge and understanding. Working with the Anti-Defamation League on The Truth About Hate allowed me to reflect on how I viewed diversity and how I viewed myself. Most importantly, over my four years at Hopkins, I grew to understand that the norm is overrated. Who wants to go around being just like everybody else? Not me. I learned to refuse to be reduced or excused. I had come to realize that I needed to demand my own space, rather than conform to standards that hindered my identity or self-expression. I learned not to apologize for being “a little too loud." I learned not to apologize for my lack of absolute athleticism. I learned to sing, dance, or laugh when I pleased. I have come to realize that I am only limited by the boundaries I allow myself to be confined by. I am passionate about creating a world where my humanity is not determined by my accomplishments as a black man, but by my character. I have learned to find beauty in black solidarity, which should not be seen as threatening or concerning to a white audience, but simply natural. I have recognized that I am able to be whoever it is that I want to be. I am delighted in the brown skin that hugs me.